With Page Backgrounds, you have full design control over each page of your proposal. You can add one of our "Stock Backgrounds" or upload your own. Page backgrounds can be used to add just some design elements to your pages, or can be used to create the entire content of a page. Access page backgrounds from the round button at the top right of any page of your proposal or template. 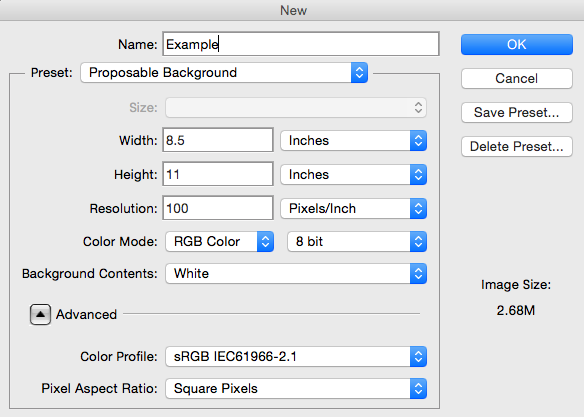 You can set a "Default Background"
You can set a background to be the default background for any new pages or sections that are created. This feature saves you time if you have a page background that you want to show on every page of your proposal - This setting automatically adds the background for you when a new page is created. Why does my background disappear when I edit an element on the page? This is how it was designed to work. Once you hit save, the page and your background image will re-appear. How do I upload my own background? Once you’ve created your background, go to your template and click on the round icon at the top right of your template. Click the "Upload +" button to browse for and select your custom background from your computer. How many backgrounds can I upload? Can I create them in InDesign? Photoshop? Yes, as long as you save your file as a JPG or PNG and the proper dimensions, you’ll be just fine. I want to upload a PDF, is this possible? No. You must convert it to a JPG or PNG first. This is a simple task that can be done with Adobe Acrobat or Photoshop.